Welcome to the 2012 24 Hour RPG Competition! Hosted at 1KM1KT and sponsored by The Free RPG Blog. This year’s theme is Little Spaces. 1. Write a roleplaying game set in a very small geography. 3. There must be a explicit reason why the player characters can’t leave the geography. 4. Spend 24 hours writing a roleplaying game set in the weeny geography. 5. Upload your game to 1KM1KT by 00:00 (GMT) 1st July 2012. 7. Check back on Saturday 1st of September 2012 to find out who the winner is, or check on The Free RPG Blog. Apart from the list above, you must obey the 24 hour RPG rules. The judge’s decision is final. £30 will be in Amazon vouchers, emailed to you. Tightness: Does the game feel like it is set in small area? I’m late to this party! That’s a shame, we might run another competition soon. 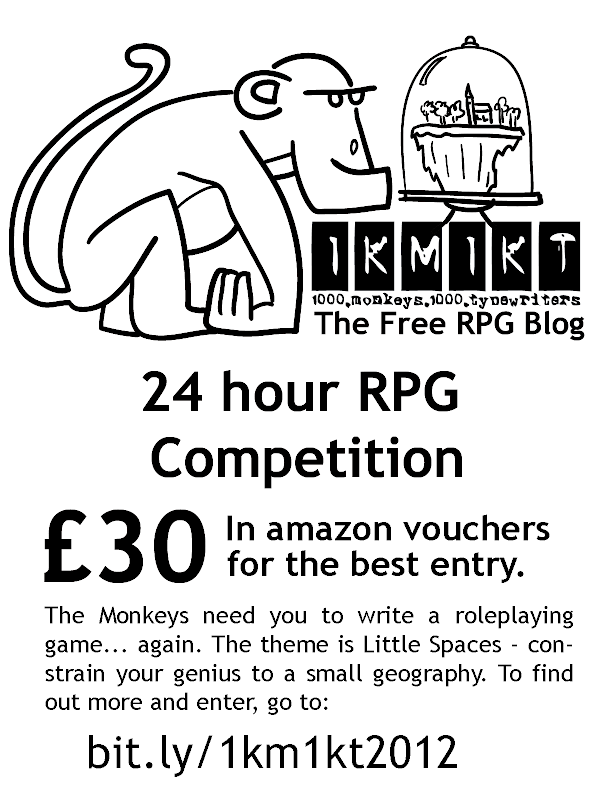 If you wrote a 24 hour RPG but didn’t get it in before 00:00 GMT 1st July 2012 then we’d still like to see it. Enjoyed it so much that you want another go? Are you bonkers? Yes? Then please do! Have another go. Enter as many times as you like! I’m not paying for the therapy you might need at the end of it, though. I want to keep working on it after time is up! Please do! Submit what you did in 24 hours and then please do keep going. You won’t get any feedback on the extended game from the judges until after the competition but there are plenty of others on 1KM1KT who can help. « Interested in Fifth edition?